Senate Majority Leader Mitch McConnell (R-Ky.) set up the two showdown votes for Jan. 24, a day before some 800,000 federal workers are due to miss a second paycheck. In the Democratic-controlled House, Jan. 23 will bring more votes on legislation to reopen the government in line with Speaker Nancy Pelosi’s demand to end the shutdown before negotiations begin. Pelosi has shown no sign of yielding, and Democrats hold the upper hand in public opinion — polls show Trump gets most of the blame for the shutdown. McConnell has rejected the House missives so far. And both Senate measures are expected to fall short of the 60 votes needed to pass, leaving little hope they represent the clear path out of the mess. But the plan represents the first test of Senate Republicans’ resolve behind Trump’s insistence that agencies remain closed until Congress approves $5.7 billion to build a wall on the U.S.-Mexico border. For Democrats, the votes will show whether there are any cracks in the so-far unified rejection of Trump’s demand. Democrats on Jan. 22 ridiculed McConnell’s bill, which included temporarily extended protections for “Dreamer” immigrants but also harsh new curbs on Central Americans seeking a haven in the United States. Senate Minority Leader Chuck Schumer (D-N.Y.) said the GOP plan’s immigration proposals were “even more radical” than their past positions. “The president’s proposal is just wrapping paper on the same partisan package and hostage-taking tactics,” offering to temporarily restore programs Trump himself tried to end in exchange for wall funding, Schumer said. McConnell accused Democrats of preferring “political combat with the president” to resolving the partial federal shutdown, which stretched into its 33rd day Jan. 23. He said Democrats were prepared to abandon federal workers, migrants and all Americans “just to extend this run of political theater so they can look like champions of the so-called resistance” against Trump. The confrontational tone underscored that there remained no clear end in sight to the closure. One freshman, Democrat Rep. Elaine Luria of Virginia, a state that’s home to many federal workers, was circulating a draft letter Jan. 22 urging Pelosi to propose a deal that would reopen the government and then consider border security legislation — including holding votes on Trump’s demand for wall money — by the end of February. A similar effort was underway last week by a bipartisan group of senators. 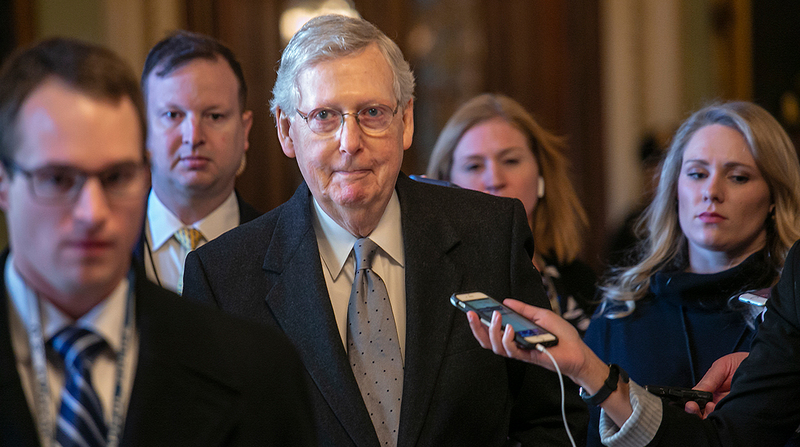 McConnell’s bill largely reflects the proposal Trump described to the nation in a brief address Jan. 19. It would reopen federal agencies, revamp immigration laws and provide $5.7 billion to start building his prized border wall with Mexico — a project Democrats consider an ineffective, wasteful monument to a ridiculous Trump campaign promise. The measure would provide a three-year extension of protections against deportation for 700,000 people covered by the Delayed Action for Childhood Arrivals program, or DACA. Democrats want far more to be protected — in negotiations last year Trump proposed extending the safeguards to 1.8 million people, including many who’d not yet applied — and want the program’s coverage for so-called Dreamers to be permanent. Trump initially tried terminating the Obama-era DACA program, which shields people brought to the U.S. illegally as children but has been blocked by federal judges. Republicans estimated the proposal would let 325,000 people remain in the United States. But the GOP proposal contains new curbs, providing those protections only to those who are already in the United States legally and who earn at least 125% of the federal poverty limit. The bill also would, for the first time, require minors seeking asylum from Guatemala, Honduras and El Salvador to process their applications at facilities the State Department is to establish in several Central American countries. Other new conditions include a limit of 15,000 of these minors who could be granted asylum. Currently, many asylum seekers apply as they’re entering the United States and can remain here as judges decide their request, which can take several years. One White House official said Trump was open to counteroffers from Democrats. The official, who spoke on condition of anonymity to discuss private conversations, said Trump was also willing to use his proposed temporary extensions for Dreamers as a way to seek long-term deal. The official said Trump would be willing to seek at least permanent legal status for Dreamers but probably not a path to citizenship.